First, let’s construct a sample of fathers and sons, matching certains characteristics of the joint distribution of father and son earnings in the United States. We will start by generated a sample of 10,000 fathers whose incomes are distributed log normally with a mean and standard deviation equal to that given in the sample if Solon (1992). The set obs command generates an empty 5,000 observation dataset. The gen id command simply creates a unique id number for each observation equal to its observation number. 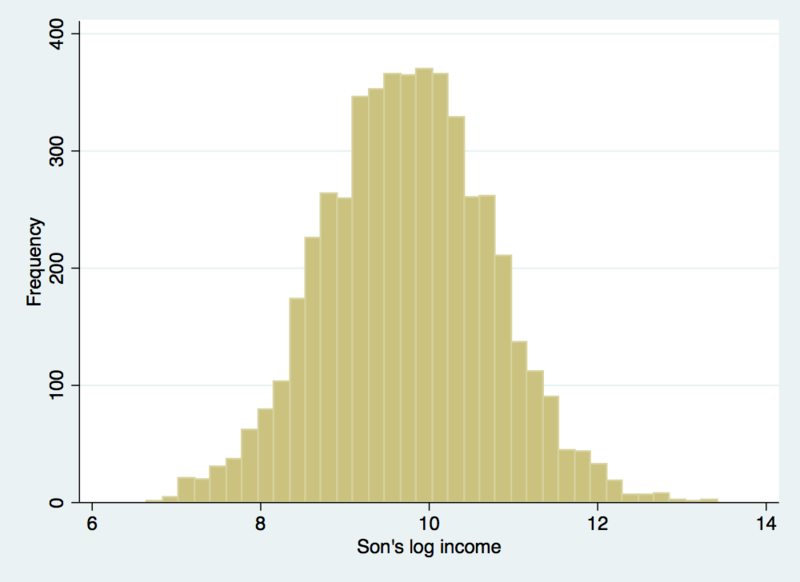 Now we are going to generate fathers’ incomes assuming that earnings are distributed log normal. We can do this by creating log income as a random variable using Stata’s rnormal function, using the mean and standard deviation from Table 1 in Solon (1992). 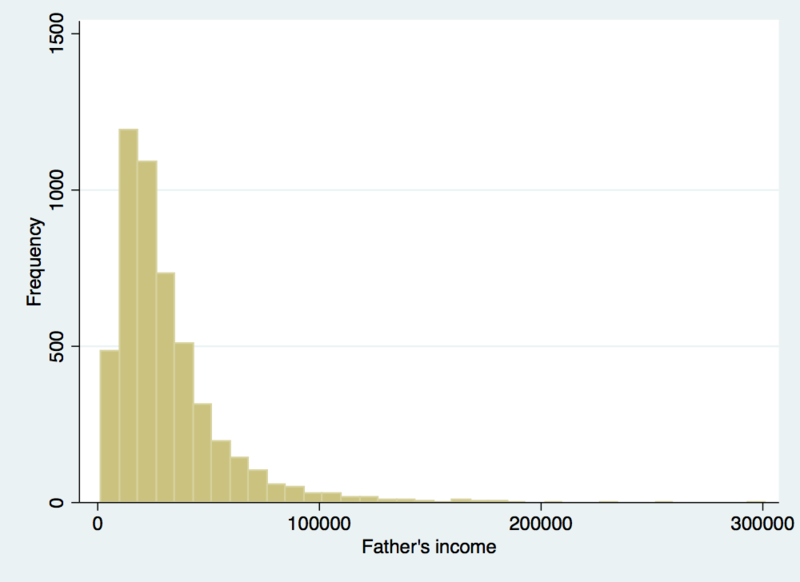 Let’s take a quick look at our generated incomes, summarizing the data, looking at the correlation between father and son incomes, and then looking at the income distributions graphically. 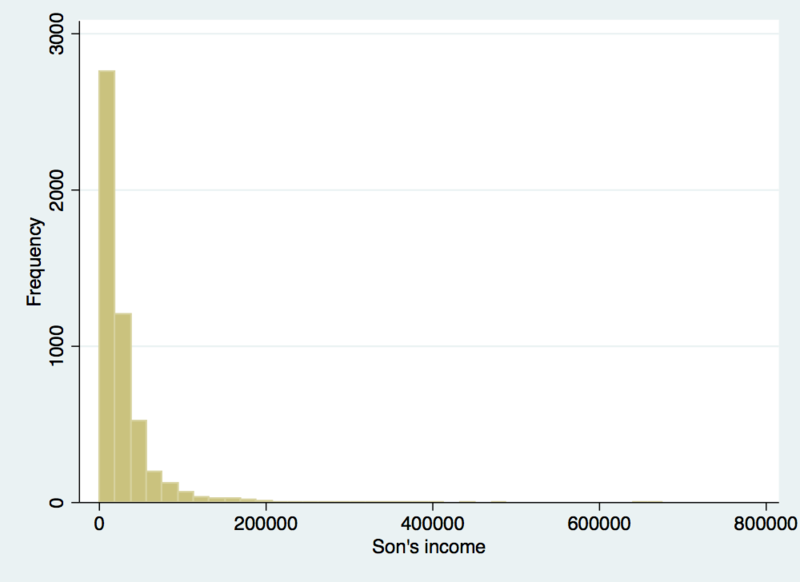 Notice the nice, linear relationship between son’s log income and father’s log income. This should not come as a surprise given that this is how we constructed son’s log income in the first place. If you would like to use the binscatter program on your own computer, you can install it with the following command: ssc install binscatter. 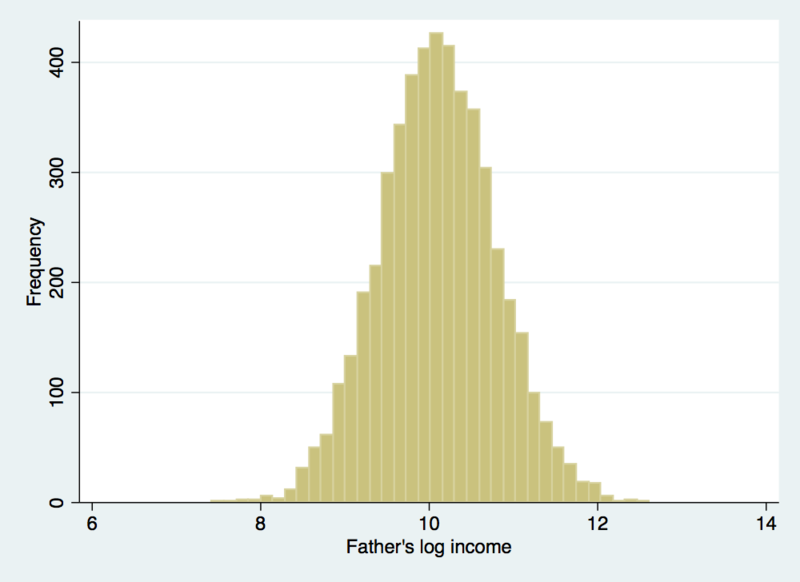 From the regression results, we see that we get a coefficient on father’s log income 0.45. Thus we have an intergenerational income elasticity (roughly) equal to that of Solon (1992). We can think of this as the true intergenerational income elasticity for our sample. Now we will consider what happens with two common problems with the way incomes are recorded in survey data: rounding and censoring. Notice that the measurement error we introduced by rounding incomes has led to an attenuation bias for the intergenerational income elasticity, substantially reducing the estimated coefficient on father’s log income to 0.39. Using rounded incomes, without acknowledging the impact of this rounding on the estimation, would lead us to conclude there is significantly more income mobility than is actually in the underlying data. The rounding exercise also demonstrates another problem. If you look closely at the commands generating new log incomes, you will notice that several missing values were generated. These missing values are cases where the income was rounded to zero and the natural log of zero does not exist, hence the missing value for log income. One criticism of the intergenerational income elasticity is that its calculation requires dropping individuals with no earnings. Notice that this further reduces our estimated intergenerational income elasticity to 0.38. The main takeaway is the same, whether we introduce mismeasurement through rounding or censoring of the data, any mismeasurement leads to the appearance of a weaker relationship between father and son’s incomes. This leads to a lower estimated intergenerational income elasticity, leading us to the false conclusion that there is greater mobility. However, this greater estimated mobility is simply the product of measurement, it has nothing to do with sons’ fortunes being less closely tied to those of their fathers. Now we will turn our attention to the difference between average income over the life cycle and income in the current period. In general, annual income over the life cycle follows a concave shape, with earnings rising over the early career of an individual and then falling in the final years of the career. This suggests that observing earnings very early or very late in an individual’s career will lead to underestimates of average earnings and observing earnings in the peak of a career will lead to overestimates of average earnings. This problem can be handled reasonably well by controlling for a quadratic in an individual’s age. More problematic is that individuals experience transitory fluctuations in income over their careers, temporary rises and falls in income unrelated to overall trends over the life cycle. To examine the effect these transitory fluctuations have on the estimated income elasticity, let’s introduce some random ups and downs in father and son’s earnings. We can introduce these transitory fluctuations by treating our son_inc and father_inc variables as our average lifetime annual income and creating a new observation of annual income that includes a random increase or decrease relative to this average income. 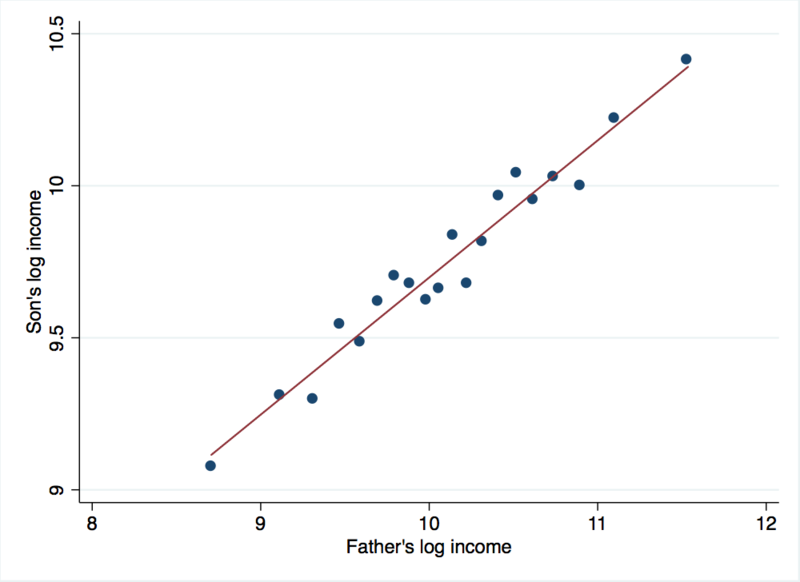 The effect on the estimated coefficient on father’s log income is quite small. This result seems to run a bit counter to what we see in real world data. For example, Table 2 in Solon (1992), our source for our empirical elasticity estimate, demonstrates a clear increase in estimated intergenerational income elasticities as more periods are used to construct average incomes. In a more recent example, Mazumder (2005) finds large changes in the intergenerational income elasticity when using a single observation of annual income versus an average of several years of annual income observations (see Figure 4). One important difference is that our random income shocks may be a bit different than real world random income shocks. In particular, Mazumder notes that transitory income shocks may exhibit some persistence. This autocorrelation in real-world transitory shocks will further weaken the association between father and son incomes, creating a greater attenuation of the intergenerational income elasticity estimate.